Did you capture the amazing display? 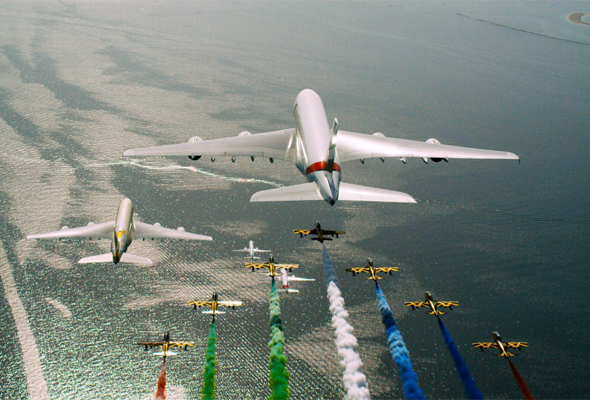 All four UAE airlines linked up for a stunning flypast on Sunday December 2, to mark UAE National Day and celebrate the Year of Zayed. Emirates, Etihad Airways, flydubai and Air Arabia were joined by Al Fursan, the Emirates’ aerobatics demonstration team, to perform the unique flypast – which saw the four airlines collaborate for the first time ever. The flypast saw 11 airplanes take to the skies, with the four commercial planes and seven Al Fursan Aermacchi MB-339A jets travelling from Ras Al Khaimah across all seven Emirates, finishing in Dubai. On their journey, which took off at around 1.30pm, the aircrafts passed several UAE landmarks including the Sharjah Corniche, Abu Dhabi Grand Mosque and Dubai’s Palm Jumeirah.